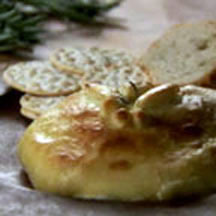 Baked Camembert with pears and cranberries is a luscious and elegant hors d'oeuvre you will be proud to serve. Thaw the puff pastry sheet at room temperature for 30 minutes. Combine the egg and water in a small bowl to create a wash and reserve. Add the pear slices and brown sugar and sauté until lightly softened, about 5 minutes and stir in dried cranberries. Remove from the heat and allow the fruit mixture to cool slightly. Unfold the pastry sheet onto a lightly floured surface. Roll to about an 11-inch square and cut off the corners to make a circle. Cut the Camembert in half using a sharp knife heated with hot water. Place the lower half of the Camembert in the center of the pastry sheet and top with half of the pear mixture. Place the top of the Camembert - cut side down - on top of the pears. Top with the remaining fruit mixture. Arrange the leaves and balls decoratively garnish with a little rosemary and brush with more of the egg mixture. Now bake in a preheated oven until its golden brown - about 20 minutes. Let it stand for 15 minutes before serving.